you never come all the way back." 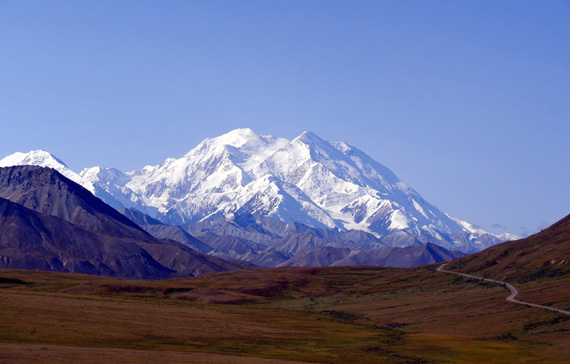 A week after leaving Alaska we're physically back in the Lower 48 -- but are we really "back" mentally and psychologically? That might take longer. Anyway, it's good to be back home in the Lower 48! Even Malmstrom feels a little bit like "home" because it's the fourth time we've been here. It made a nice staging place for both Alaska trips and it's a nice place to land and spend a few days after returning from the Far North. 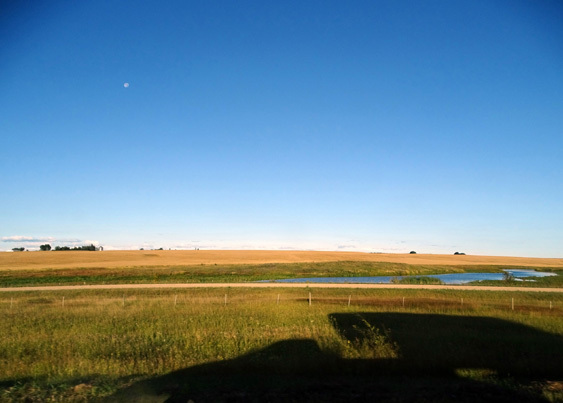 We plan to be here for a week so we can rest up, get a lot of things done, enjoy the long bike path, and take advantage of the low weekly campground rate. 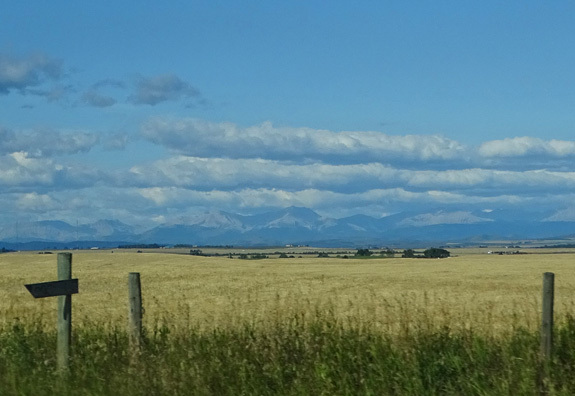 We drove from the Walmart in Olds, Alberta to the Gateway FamCamp on Malmstrom AFB in southeastern Great Falls, Montana. We left Olds at 7:45 AM and got to Malmstrom's Gateway FamCamp at 3:45 = 8 hours. 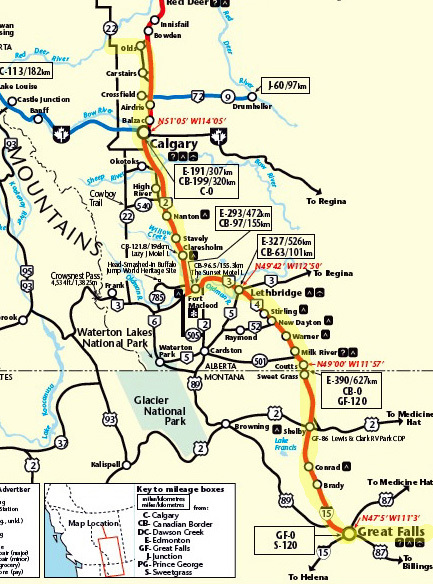 We had five stops or slow-downs -- a traffic wreck in Calgary took 20 minutes for us to go about a mile; we stopped at a rest area south of Calgary to eat some cereal; got through the border in only 3-4 minutes total (more below); rest area at Sweet Grass, MT to fix sandwiches; and fuel station in Shelby, MT, where we should have filled up but got just 10 gallons at $2.48/gallon minus 5% with our Visa discount. We assumed diesel would be less in Great Falls but it's $2.53-4 here and gasoline is $2.65 at most stations we saw. In some states gas is under $2 now. 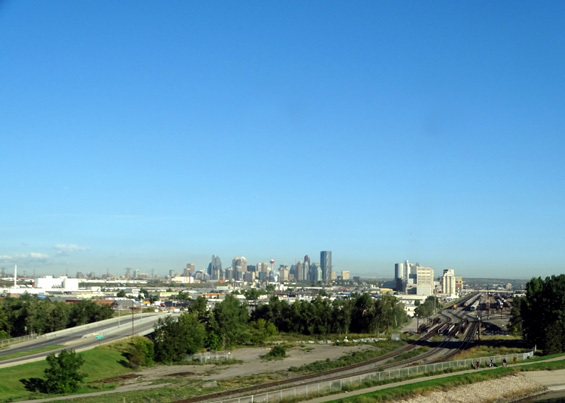 We knew about the accident in Calgary before reaching it but had no good alternative at 8:45 AM. Traffic was much heavier than we expected through the city at that time. What's amazing is that it's only the second wreck we've seen this entire trek to and from Alaska. Oh, sure, we heard about plenty of them in Anchorage, the Seward Hwy., etc. but we never saw them. 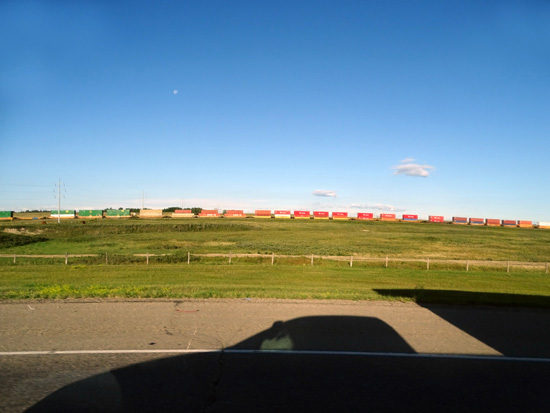 The border crossing back into the U.S. at Sweet Grass, MT was quick and the easiest we've ever had. We waited a couple minutes for the truck in front of us, then pulled up to the window. Casey-pup worked her wiggly magic on the older male agent, who came back with bones for both dogs after checking our passports. He asked only three questions -- how long we were in Canada, whether we have any alcohol or tobacco, and if it was OK to give the dogs a treat! Yes, sir, and thank you for making it so easy! I was less concerned about this crossing than the one into Canada last week but still, you never know when some random cosmic number comes up and it's your turn to be searched thoroughly like we were in New Brunswick last summer. 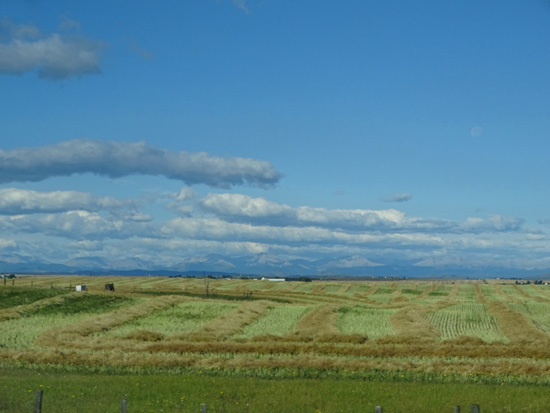 The weather was near-perfect all day -- mostly sunny, dry, some moderate wind while we were driving through farmland in Alberta and northern Montana with signs warning about potential strong winds. It was 51 F. overnight in Olds and in the mid-80s F. when we got to Great Falls. That's higher than normal but it was even higher in Great Falls last week (90s). We were happy when we got back here after our first Alaska trip and it was in the 80s for several days in mid-September. That was an even wetter, colder summer in Alaska than this summer. We also appreciate the warmer, drier weather this time. 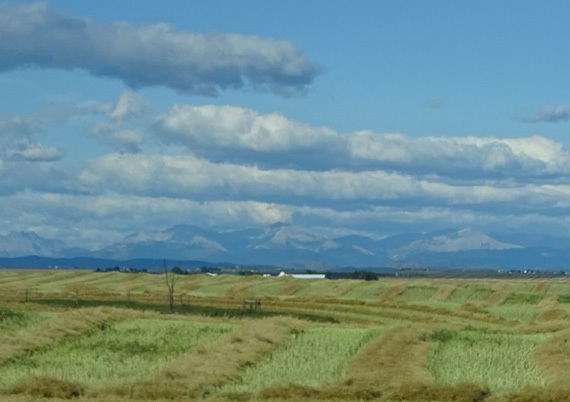 I think this is hay that needs to be baled in Alberta. Tomorrow should be warm and sunny in Great Falls until late afternoon, when a cold front is bringing much-needed rain to the area. That's not such good news to us but it is to Great Falls. 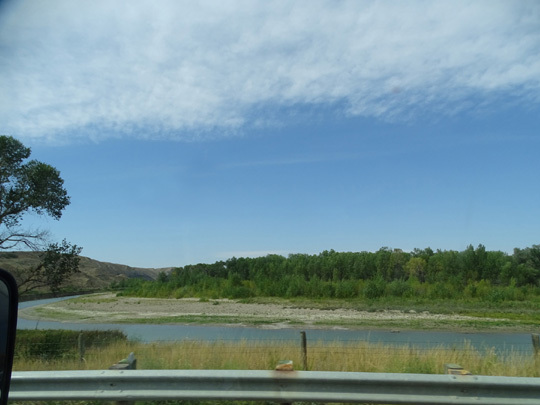 The whole Northwest region of the U.S. and western Canada has been in a drought this summer. 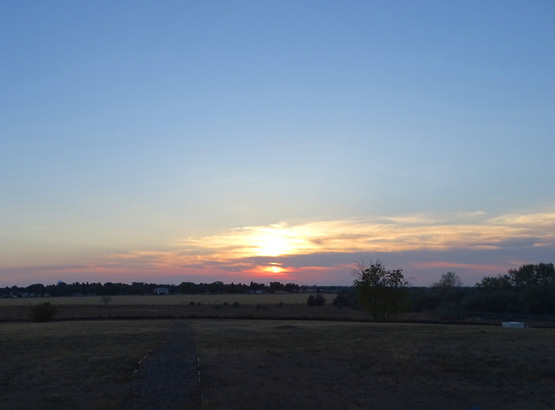 Grass in fields and yards is brown and crunchy from lack of rain, and wildfires are rampant. Rain, high winds, snow, Labor Day crowds -- all good reasons we didn't go down the Cassiar Highway and through those national parks on our way back from Alaska. 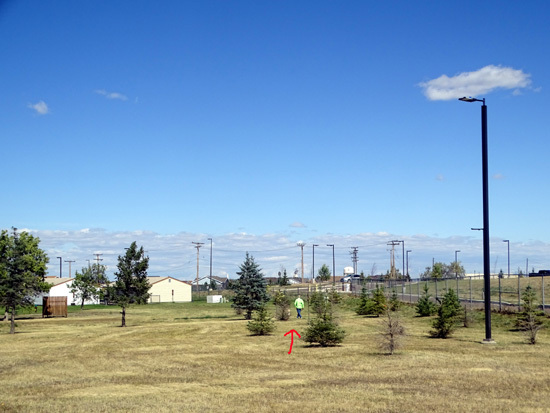 Jim was concerned that the campground at Malmstrom AFB might be full but at least half the sites are empty so we were able to get into the same site we occupied in May. We like it because there is plenty of room for all three of our vehicles and no one is on our doorside. In fact, our "front yard" is a whole field! The door faces north and is shaded most of the afternoon and evening. The front cap (no windows) faces west into the afternoon sun -- and wind, if it gets as bad as predicted. The orientation is perfect for warm weather but could be chilly if it gets cold. The daily rate for full hook-ups and free WiFi is $24. The WiFi is pretty good, the phone signal is strong, and we get NBC, CBS, ABC, and PBS with our own TV antenna. The weekly rate is only $130 = $18.57/day. Since MWR is closed today and tomorrow, we have until Thursday to decide if we'll stay a week. Except for the weather, this is a good place to be for the Labor Day holiday weekend. It may rain several days this week and it's supposed to get rather chilly (50s and 60s F. for highs in a couple days). We figure we'll do outside things and shampoo the rug tomorrow while it's hot and dry, then do other things when it's cold, rainy, windy, or otherwise less pleasant to be outside. The campground host said most sites were full every day in July and August, until this past week. Folks can't reserve here, so we lucked out in both May and now with a good selection of sites. The air quality is also good today. It's reportedly been pretty bad since mid-July, with wildfires in WA, OR, ID, and western MT causing hazy skies and worse. It's nearly dark here by 8:30, which is a surprise. That's because the sun is down, not because of smoke. Sunset was about 8 PM. We've been so far north all summer, with very long hours of daylight, so this is a bit of an adjustment for us. After we got set up we got the car out of storage on base. It's good to have the Odyssey back! It was dusty but nothing bad happened, like hail damage or someone running into it. We put mothballs under the hood and under the vehicle to keep rodents away. Jim used a solar battery charger to keep the battery well-charged. The car started right up. On the way home we washed both the car and truck at a car wash on base. It was just faster and more thorough than washing them at our campsite. I didn't have time today to begin organizing the items that are in the back of the van. We left a bunch of things there to save weight in the camper during the long drive to and from Alaska. I can't even remember most of what's back there! Jim says that means we really don't need it . . . Kinda like half the stuff from our house in the storage unit in Virginia! This 2002 car has 127,093 miles on it and it's still in great shape -- best vehicle I've ever had. 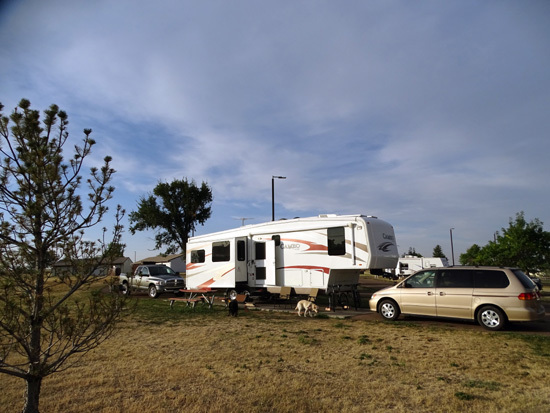 It's sometimes a pain to travel with it plus the RV and truck (have to drive separately in transit from one campground to the next, costs extra to park it at some campgrounds/RV parks, extra $$$ for maintenance and insurance, etc.) but it's so handy to have that we plan to keep it for a while longer. Above and below: Jim plays ball with Casey in our large "front yard"
After supper I walked Cody in the large field between the campground and highway. He's almost back to normal now after his unexpected bout with Vestibular Disease. 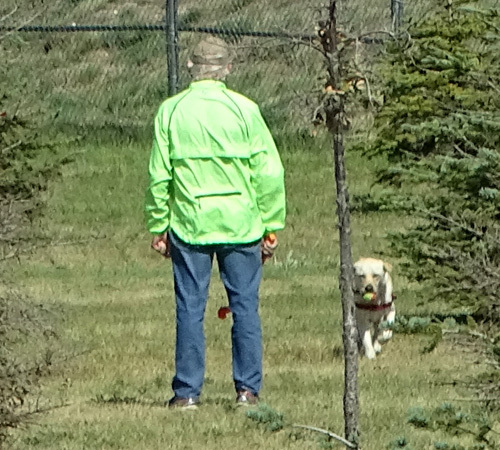 Jim played ball with Casey (photos above) and took her for a run with the bike. All four of us will be getting more like our normal amount of exercise now, instead of riding all day for days on end. We're tired of that and glad to be in one place for a few days again. There are two nearby huskies both our dogs want to meet. 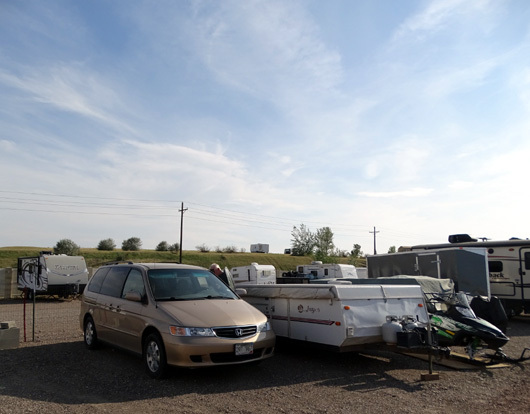 Jim noted two other RVs with South Dakota tags so tomorrow we'll get out and meet some of our new neighbors.